This is THE BEST 40A ESC for multicopters! Combined with the SimonK firmware, it provides the best combination of hardware and software. I have personally used this to build an Octocopter and I can highly recommend it. They are ideal for any tricopter, quadcopter, hexacopter, octocopter, etc., where a high refresh rate is needed. 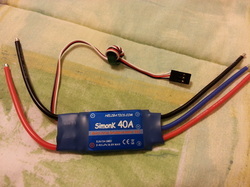 Perfect for feeding a flight controller such as APM2 or APM2.5, etc., which needs a 5.3V input! Highest accuracy with Crystal Oscillator (Temperature won't affect the PWM operating range like other cheap ESC's). Super high refresh rate, no buffering of the input signal, resulting in more than a 490Hz response rate. Don't buy a 40A multirotor ESC that doesn't meet all these criteria! There are a lot of low quality 40A ESC out there! Peak current: 60A (10s) <= large reserve capacity! NOTE: Before you buy, you should make yourself familiar with the somewhat experimental nature of the SimonK firmware. This software pushes the motor response to the limit, so there may be motor and prop combinations that won't work. Due to the lack of overcurrent/overheat/low voltage sensing (needed for multirotors), it's easier to destroy the ESC and possibly the motor too. I can't tell you what will or won't work, other than the motors I sell that I've personally used, so please consult the main SimonK threads on various forums for more info. Neither I, nor SimonK will be responsible for any damage that may occur, so know and accept the risks before using these. That said, I've personally had fantastic results with this firmware and wouldn't use anything else! Click below to buy now. You can change quantity at checkout. Thanks!